In this show, Sara pulls back the curtain on motherhood. We talk about how she turned her pregnancy from one of passion and purpose into her business. Sara talks about filling a gap in the market, finding her niche and teaching to those who needed her message and point of view. I love that Sara is so candid and in this show, she openly shares both her hits and her mistakes. She is a truth teller with a heart of gold and discusses the importance of discovering and living from a place of who you are today versus showing up as who you used to be or as you think you should be. We discuss Sara’s work with Reebok and how challenging it was to leave the company behind as she decided to follow her bliss. Sara talks about the importance of finding our own passion and purpose in addition to, and outside of life as mother, wife, and partner. We dive into the struggle of finding the balance between being selfish and selfless and how challenging it is to arrive somewhere in the middle. I love Sara’s thoughts on balance and she shared her recent experience shooting 12 workouts while trying to juggle family, friends, and laundry. It really is so refreshing to have Sara reveal her backstory, in addition to her highlight reel. 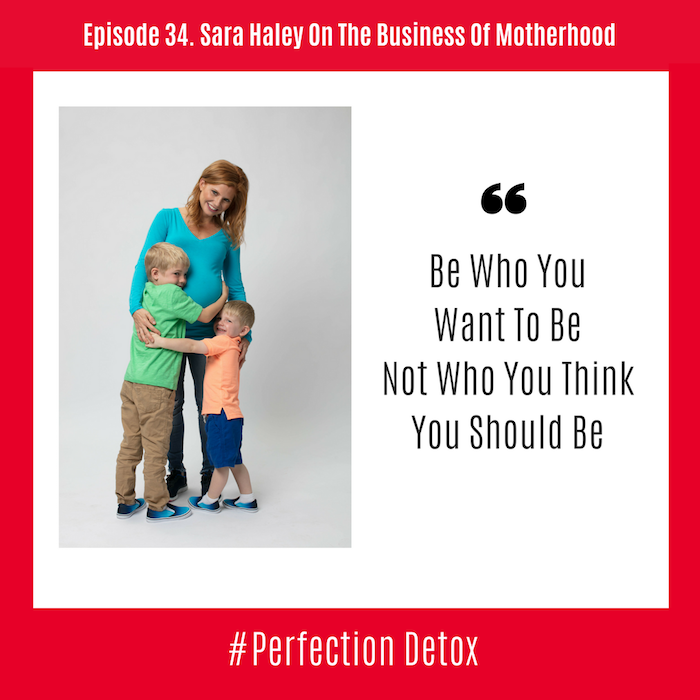 We talk about the importance of staying centered especially in a world with so much social media and Sara talks about the importance of finding other Mom’s who can celebrate you and lift you up when things get tough. Sara mentions the different seasons of life and how there will be different seasons for different experiences throughout our journey. She reminds us that children do not need us to be perfect but they do need us to present. We discuss Sara’s morning ritual and with two children how she prepares for her day the night before. In this episode, we also chat about the importance of being organized and how to set ourselves up for success by preparation, which in turn, allows us to be ready for the opportunities ahead. Sara reminds us of the importance of looking back to remember what we did well and celebrate the baby steps as we do the best we can. She reminds us to take it easy, listen to our bodies and to not compare your story to what you see in the media. Sara shares some fantastic advice and tips on the importance of doing the correct core work during pregnancy – click here for some informative videos. Sara Haley is a simple mid-westerner at heart. It was her college sweetheart, Sean (now her husband of eleven years), who really encouraged her to go after her dreams. From dancing for the NBA to performing in commercials and off-Broadway shows, Sara is forever grateful for her ten years in New York City, especially because it eventually led to her fitness career. After teaching classes all over New York City and training celebrities, her big break was being recruited by Reebok, Int. This led to seven years of working as a Reebok Global Master Trainer, which included traveling all over the world to train other fitness trainers and instructors, doing media appearances, and creating and starring in numerous Reebok & Gaiam DVD workout programs. Along her fitness journey, Sara became a prenatal and postnatal exercise specialist. Little did she know, she had found her niche. When she became pregnant with her oldest son, Landon, Sara saw a lack in challenging and inspiring workout options for pregnant women. After the birth of her first son, Sara went on to create Sweat UNLIMITED, an equipment free workout that includes 5, 15, 30, & 45-minute workouts for the busy parent or professional. Her workout DVD brand is called The Daily Sweat®, as Sara believes that everyone should sweat a little (or a lot) each day to get what they want out of life. During her postnatal recovery from her second son, Sara created her newest DVD, Expecting More®: The 4th Trimester Workout. Whether you had a baby six weeks, six months, or six years ago, the eight different workouts will help you increase your cardio endurance, tone your body, and most of all, focus on healing and strengthening the section of your body that was most affected by pregnancy – your core. This DVD as also received a National Parenting Publication Award. Though fitness continues to be a big part of Sara’s life, motherhood inspired her to expand beyond fitness and share more of her life journey and struggles, which she features on her blog and hosts webisodes on her YouTube channel. She hopes as she continues to develop this new lifestyle brand, she can help others discover the best ways to stay healthy and happy in the constant pursuit of finding the work/life balance that we all seek to have.